Class 4 have arrived at Lineham Farm safe and sound. They have settled into their bedrooms, had a delicious lunch and are now enjoying their first activities this afternoon. They are making all their teachers and the staff proud by their super behaviour. Class 4 went to Temple Newsam to learn all about its Tudor history. It was so interesting and lots of fun, especially when we got to dress up as Tudor Lords and Ladies. 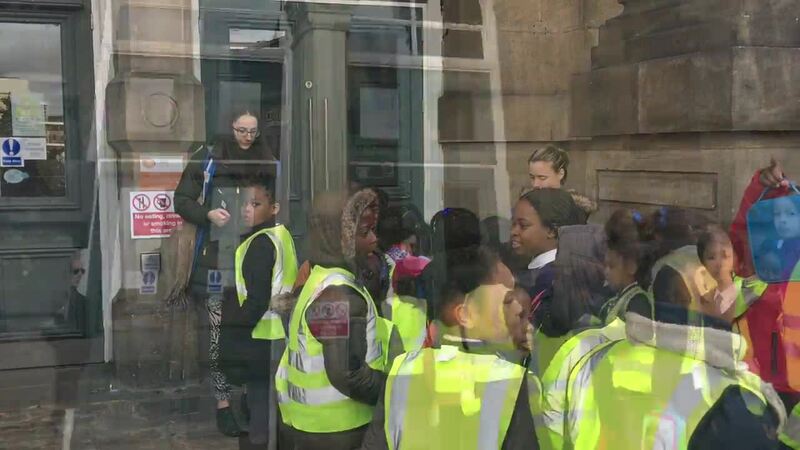 On Friday, Class 4 went on an Ancient Egyptian school trip to Leeds City Museum. We saw a real life mummy, learnt the mummification process and made our own amulets! As it has recently been World Kindness Day, Class 4 did their assembly on kindness. Here is one of the songs that we performed. Class 4 made a Swiss Cheese Fondue as part of their learning about Switzerland for International Week. Obviously, we all had to taste some too, so we cut up warm bread, apples and green beans to dip into it. Yummy! As part of our International Week celebrations, all classes enjoyed an Indian Dance Workshop - class 4 had lots of fun! On Friday, children spend their Big Write session publishing their English work from the week. The atmosphere was beautiful and calm and all the children produced excellent pieces of work - some which have made it to our 'Wonderful Writing' board! Class 4 went to Leeds Central Library for a workshop all about Nick Sharratt! There were so many exciting activities to do and we learnt lots about one of our favourite illustrators! As one of our final rewards of this year, Class 4 were treated to an afternoon of making smoothies! We used lots of different fruits, flavoured yoghurts and juices to make them. Yum Yum! It was Class 4's Assembly this week and we focused on the positives of being different and unique. As we all loved the film, 'The Greatest Showman', our assembly was based on two of the songs from it. Class 4 went to Temple Newsam last week to learn about The Tudors. We were able to look around the impressive house, dress up as Tudors and learn how to do our own portraits of rich Tudor people. We had so much fun and learnt lots! Today Class 4 had a great time during our Sound Workshop, which introduced our new science topic. We learnt all about how sound is made, how sounds can change and how to make our own musical instruments. The children have all had a good night, enjoyed their breakfast and ready for more fun today. For our final Science lesson on electricity, Miss Potter let us design and created our own switches. Here are some examples of the successful ones that we made! As the pool was closed, Andy and Ste, our swimming instructors, taught us how to administer CPR to adults, children and babies. We did such a good job, they then taught us some basketball skills as a reward. Class 4 have been to plant some new trees next to the Naseby Flats. We learned all about how to give them the best chance of survival. We can't wait to watch them grow over the years, especially since so many of us will walk past them every day on the way to school. Today, Andrew, from the Discovery Centre came and showed us objects from Ancient Egypt. They were all at least 3,000 years old! Then, we got to make our own lucky amulets from clay beads and scarab beetles! Class 4 enjoyed making a Swiss Fondue as part of our study of Switzerland for International Week. We enjoyed tasting it even more though! As part of International week and learning about other cultures, Class 4 learnt a Brazilian style of dance called Capoeira which incorporates martial arts and dance. Here we are in action! Mrs Docherty visited Class 4 to explain about the issues of litter and how we can improve our environment by recycling. She helped us to create lunch boxes out of used milk cartons. Class 4 created their very own T-Shirt designs around the theme of 'working in a team'. They then sewed their designs onto T-Shirts and are now able to wear their creations every Wednesday, during our 'Team Time' sessions. Class 4 used a variety of musical instruments to create a piece of music for each season of the year. Miss Potter, Mrs Rowe and Miss Spinks all thoroughly enjoyed the final performances! Class 4 have really enjoyed their Electricity science topic this half term. They even managed to use objects from around school to create their own switches. Class 4 went on a trip to Temple Newsam to discover all about The Tudors, a topic that they've been studying in History this half term. During the workshop in the morning, the children learned all about the different Tudor clothing garments and were all able to dress up in Tudor clothes. They even performed 'The Peacock' dance, Anne Boleyn's favourite, in their clothes in the Picture Gallery. In the afternoon, the children learnt all about the weird and wonderful objects that people used every day in Tudor times. Finally, they used their dectective skills to discover which parts of the house still remained from Tudor times. A great day was had by all! Last week, it was Class 4's Assembly which focused on their last Geography Topic: Cities. They shared some really interesting facts about Leeds as well as acted out the lives of famous people who were from the area that our school is in. They finished the Assembly with their Class song. If you missed it, here are some photos. Class 4 enjoyed a lovely afternoon at Moortown Baptist Church. They watched a performance which brought the Christmas Story to life, then they spent time in groups, either making Christmas tea light holders, or listening to the Christmas story from a Shepherd's perspective and a Wise Mans perspective. Class 4 enjoyed a great day out at Leeds City Museum. As part of their topic about Egypt, they learnt all about mummification and ancient Egyptian artefacts and also got to explore the rest of the museum. Class 4 had a fantastic time skipping in the sun! They learnt lots of new tricks and skipped in teams as well as practicing their solo skills. Year 4 enjoyed an amazing day at Herd Farm. They participated in all sorts of activities, including archery, an assault course and a zip wire! The sun shone and the children had a fantastic time! On Thursday 30th June Year 4 spent the whole day learning about "coding" and programming computers, as well as a bit of history about computers. They worked on iPads all day and also discovered just how much we rely on computer today. They also learned how to turn the I-pad into an etch a sketch. Class 4 have been doing a topic about recycling, which even included a visit to a quite smelly recycling plant to see how our rubbish is recycled. 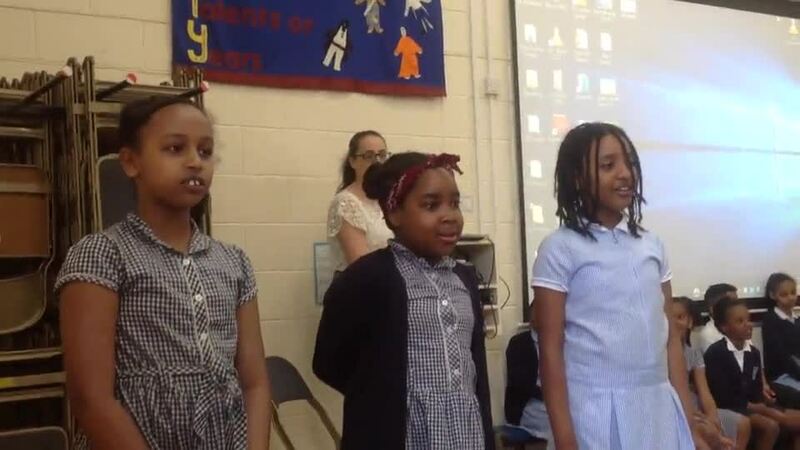 In their brilliant assembly, they taught the rest of the school, and parents, all about it! Sometimes in PE, the children run the Golden Mile, which is 12 laps around the playground. The children seem to really enjoy doing it and some get very competitive, doing over 20 laps! Class 4 spent the morning learning about recycling and found some quite ingenious uses for plastic carrier bags with a little help from their friends - after a short PowerPoint presentation the children spent a happy time cutting up the bags into strips they could weave to make squares. After the squares were created they were heated to fuse the plastic together. While that was going on the children cut up some more bags to make decorations such as ladybirds and other bugs which were then fused onto the woven squares. Class 4 will be studying recycling in more detail after the Easter holidays which will include a visit to a recycling facility here in Leeds. Class 4 enjoyed a lovely visit to Scott Hall Christian Fellowship Church, where they learnt about lots of different bible stories, including Adam and Eve and Noah and the Flood. The looked at the displays, tasted some biblical foods, like figs, olives and pomegranate, and had fun doing some craft activities. They alsoi had a quiz and the winner will be announced in an assembly soon!